The Vinh-Long was a 5,500-ton screw steamship that was built in 1881 as a military transport for the French Navy. At that time, France had a large empire and ships like the Vinh-Long were needed to move men and material to French colonies all over the world. She continued working as a military transport until the start of World War I, when she was converted into a hospital ship. After the war ended in 1918, the Vinh-Long returned to her former duties as a troop and supply transport. Early in the morning of 16 November 1922, while sailing with 495 passengers approximately 10 miles off the coast of Turkey in the Sea of Marmora, the Vinh-Long caught fire. The crew tried to extinguish the fire, but the flames spread rapidly throughout the elderly transport. Suddenly, the gunpowder magazines in the after part of the Vinh-Long blew up, causing the fire to engulf almost half of the ship. All seemed lost for both the passengers and crew when, in one of those strange but fortunate quirks of fate, another ship just happened to steam into the area. It was the US Navy destroyer Bainbridge (DD-246) that was passing through the Sea of Marmora on its way to Constantinople. The Bainbridge was part of a small US naval detachment sent to Turkey in 1922 and was on patrol off the Turkish coast when her Commanding Officer, Lieutenant Commander Walter A. Edwards, noticed that a ship was on fire five miles astern of his ship. Edwards quickly ordered the Bainbridge to steam towards the Vinh-Long. Five minutes after he arrived on the scene, another explosion blew the transport’s mainmast over the side. Edwards maneuvered the Bainbridge’s bow alongside the bow of the Vinh-Long, which seemed to be the only part of the transport that was not on fire. Hundreds of passengers (which included civilians as well as military and naval personnel) had gathered on the bow of the Vinh-Long to escape the flames, which were creeping closer to them. As soon as the Bainbridge’s bow was next to the Vinh-Long’s bow, passengers began sliding down rope lines to the American destroyer. Other passengers had made it into the water and were being picked up by lifeboats from the Bainbridge. The crew of the Vinh-Long had also launched several lifeboats and the Bainbridge was picking them up as well. In all, the Bainbridge managed to rescue 482 of the Vinh-Long’s 495 passengers and crew. Concerned that the forward magazines of the Vinh-Long were about to explode, Lieutenant Commander Edwards decided to sail away from the burning transport as soon as the last passenger was brought on board his ship. It was difficult finding room on the small destroyer for all the survivors (since the ship normally carried a crew of about 100), but the Bainbridge managed to get them all back to Constantinople. As soon as the Bainbridge arrived in Constantinople, the passengers and crew of the Vinh-Long were transferred to the French armored cruiser Waldeck Rousseau. At the time, the rescue by the Bainbridge received much international acclaim. The officers and crew of the destroyer were officially commended for their heroic actions and Lieutenant Commander Edwards received America’s highest military award, the Medal of Honor. Edwards also received the French Legion of Honor and the British Distinguished Service Order. Although the Vinh-Long had a dramatic end, ships like it typically led a tough and tedious life and received very little recognition. But empires needed them as much as warships in order to survive. They moved troops and military supplies to far-off colonies and brought back people and cargo to the mother country. The Vinh-Long gave France more than 40 years of faithful service. Had it not been for the fortuitous intervention of an American destroyer, she would have met an extremely tragic finish in the Sea of Marmora. Figure 1 (Top): The Vinh-Long moored at Toulon, France, circa the 1890s. The original print is from Office of Naval Intelligence files. U.S. Naval Historical Center Photograph. Click on photograph for larger image. Figure 2 (Middle, Top): The French transport Vinh-Long burning on 16 December 1922. The Vinh-Long is on fire in the Sea of Marmora near Constantinople, Turkey, on the morning of 16 December 1922. Survivors in lifeboats are nearby. Photographed from the USS Bainbridge (DD-246), which was coming to Vinh-Long's assistance. Donation of Frank A. Downey, 1973. U.S. Naval Historical Center Photograph. Click on photograph for larger image. Figure 3 (Middle, Bottom): The French Transport Vinh-Long burning on 16 December 1922. The USS Bainbridge (DD-246) noses into Vinh-Long's port bow to remove her survivors, in the Sea of Marmora near Constantinople, Turkey, on the morning of 16 December 1922. This view was taken shortly before an explosion spread flames into the forward part of the ship. Photograph from the Bureau of Ships Collection in the U.S. National Archives. Click on photograph for larger image. Figure 4 (Bottom): The burning French transport Vinh-Long. The Vinh-Long is aflame from stem to stern in the Sea of Marmora near Constantinople, Turkey. This view was taken from the USS Bainbridge (DD-246) soon after she had removed Vinh-Long's survivors. Note that the transport's mainmast has fallen overboard, the result of a series of explosions that spread flames into the forward part of the ship. Photograph from the Bureau of Ships Collection in the U.S. National Archives. Click on photograph for larger image. The Norwegian Haakon VII started its life as the USS Gardiners Bay (AVP-39), a small 2,592-ton Barnegat class seaplane tender that was built in 1944 at the Lake Washington Shipyard in Houghton, Washington. Named after a bay in Block Island sound, New York, the Gardiners Bay was commissioned at the Puget Sound Naval Shipyard on 11 February 1945 and was almost 311 feet long, had a beam of over 41 feet, and had a crew of 215 men. The Gardiners Bay could make a respectable 18.2 knots and was armed with one 5-inch gun and eight 40 mm anti-aircraft guns. The Gardiners Bay was quickly sent to join the US Pacific Fleet and, throughout the remainder of the Pacific War, she acted as a seaplane tender and rescue ship in several major areas, including Eniwetok in the Marshall Islands, Saipan and Guam in the Marianas Islands, and Kerama Retto, Okinawa, where she arrived on 7 June 1945. While steaming off Okinawa, the Gardiners Bay acted as a flagship of an Air-Sea Rescue unit that successfully completed 18 rescue missions in approximately two weeks. It was a grueling mission with the ship in a constant state of alert and her crew staying at “General Quarters” for 100 hours. She stayed in Okinawa until Japan surrendered, at which point she was sent into Tokyo Bay to set up a seaplane base as part of the Japan Occupation Forces. On 1 September 1945 the Gardiners Bay became the flagship of the Air-Sea Rescue Unit for the US Third Fleet. She stayed in Japan until 29 January 1946, when she was sent to Shanghai, China, to assist in Air-Sea Rescue operations there. The Gardiners Bay then sailed to the Puget Sound Naval Shipyard on 28 November 1946 for a major overhaul. The Gardiners Bay was sent back to the Far East on 7 April 1947 and was assigned to various American naval bases in the Pacific until 1950, when she returned to the United States for another overhaul. On 27 June 1950, the Gardiners Bay left San Diego for the first of four long tours of duty during the Korean War, where she supported United Nations forces as a seaplane tender in Korea. She also went on to support seaplane operations in Japan and the Philippines. After the war ended in Korea, the Gardiners Bay completed three more cruises as a seaplane tender for the Seventh Fleet in the Pacific, from July 1954 to November 1957. She returned to the United States on 16 November 1957 and was decommissioned on 1 February 1958. This tough little ship received two battle stars for its service during World War II and four battle stars for its service during the Korean War. But there was still a lot of life left in the Gardiners Bay. On 17 May 1958 this ship was given to Norway under the Military Assistance Program and renamed the Haakon VII. The Haakon VII was converted into a naval cadet training ship and sailed all over the world in that role. She gave Norway many years of useful service, but the ship was finally disposed of in 1974. The Gardiners Bay/Haakon VII was a sturdy ship that served in two navies for almost 30 years. She fought in two wars and was still able to make numerous contributions in peacetime as well. Not a bad record for a ship that few people even knew existed. Figure 1 (Top): USS Gardiners Bay (AVP-39) off the Lake Washington Shipyards, Houghton, Washington, 18 February 1945. She is painted in camouflage Measure 33, Design 1F. Photograph from the Bureau of Ships Collection in the U.S. National Archives. Click on photograph for larger image. Figure 2 (Middle): USS Gardiners Bay (AVP-39) off the Lake Washington Shipyards, Houghton, Washington, 18 February 1945. She is painted in camouflage Measure 33, Design 1F. Photograph from the Bureau of Ships Collection in the U.S. National Archives. Click on photograph for larger image. Figure 3 (Bottom): Norwegian Training Ship Haakon VII, 1958, passes Hains Point, Washington, DC, following a visit to the Washington Navy Yard, 9 March 1970. Monuments and landmarks visible in the background include the National Cathedral (on ridgeline in center distance), the Jefferson Memorial (center, middle distance) and the Washington Monument (right distance). Official U.S. Navy Photograph. Click on photograph for larger image. Named after a famous Norwegian naval hero, the Tordenskjold was a 3,858-ton coast defense battleship built in England for the Norwegian Navy. Part of the two-ship Tordenskjold class (consisting of the Tordenskjold and the Harald Haarfagre), the Tordenskjold was commissioned in March 1898. The Tordenskjold class, along with the two slightly newer and larger ships of the Eidsvold class, served as the backbone of the Norwegian Navy for almost 40 years. Coast defense battleships were a unique type of warship built from around 1860 to 1920. Their primary mission was coastal defense and not operations in the open ocean. Although called “battleships,” they were usually cruiser-sized warships that sacrificed range and speed for guns and armor. They were usually built for nations that could not afford real battleships and were designed to operate in shallow coastal waters. Several were built for use in Scandinavian waters, which were not only relatively shallow, but also filled with fjords and small islands. Some even steamed in large rivers, providing enormous firepower against land targets. Coast defense battleships differed from monitors in that they had a higher freeboard, were faster and were much more heavily armed. They were also more heavily armed and armored than light cruisers or gunboats and were faster and more powerful than any monitor, which made them useful warships for smaller countries with long coastlines. 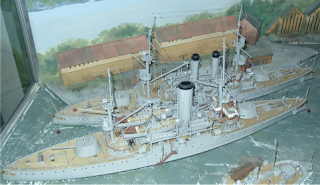 For its size, the Tordenskjold was heavily armed with two 8.2-inch guns, six 4.7-inch guns and six 3-inch guns. She was 92.66 meters long, had a beam of 14.78 meters, and a top speed of 16.9 knots. The Tordenskjold had two turrets (one fore and one aft), each holding one 8.2-inch gun, and a 7-inch armor belt around the ship as well as 8 inches of armor on the turrets. With a crew of 245, the Tordenskjold and her sister ship provided the Norwegian Navy with a credible defense for its long coast. The Tordenskjold class and the Eidsvold class coast defense battleships managed to maintain Norway’s neutrality during World War I (1914-1918), even though they were grossly outnumbered by both the German and British navies. After World War I Tordenskjold and her sister ship were converted into training ships and they served in that capacity until the 1940, when Norway was invaded by Germany. During the Battle for Narvik in 1940, the Eidsvold class coast defense battleships (the Eidsvoldand the Norge), which were larger and more heavily armed than the Tordenskjold class, were sunk with heavy loss of life by German destroyers. Although the Eidsvold and the Norge were bigger and more powerful than the German destroyers, they were also old, slow and the crews of the two Norwegian ships were not adequately trained to fight faster and more modern warships. The German destroyers sank the ships using torpedoes that proved to be devastating against the coast defense battleships (since the Norwegian ships were armored against other surface ships and not torpedoes). But the Tordenskjold and her sister ship Harald Haarfagre were captured by the Germans and were converted into floating flak batteries. Although the ships were more than 40 years old, the Germans thought they were worth keeping, albeit in a different capacity. Armed with a large number of anti-aircraft guns, the Tordenskjold was renamed Nymphe by the German Navy and she served as a floating flak battery until May 1945, when she was bombed by Allied aircraft and was forced to be beached to prevent her from sinking. After the war the Tordenskjold was returned to the Royal Norwegian Navy and temporarily served as a floating barracks before she was sold for scrapping in 1948. In their day, the Tordenskjold and the other coast defense battleships were useful for protecting coastal waters. Although they proved effective in World War I, by World War II they were no match for more modern warships. The Tordenskjold also showed that a warship could still have a very active and useful career even after it has been captured by another country. The Tordenskjold was a prize of war, a tradition that goes back centuries, and the Germans made the most of it. Figure 1 (Top): Norwegian Coast Defense Battleship Tordenskjold. Photographed by A. Renard, Kiel, Germany, 1900. U.S. Naval Historical Center Photograph. Click on photograph for larger image. Figure 2 (Middle, Top): German Anti-Aircraft Ship Nymphe (formerly the Norwegian Tordenskjold) in 1940. The ship is surrounded by torpedo defense nets in a Norwegian harbor during World War II. Note her camouflage. U.S. Naval Historical Center Photograph. Click on photograph for lager image. Figure 3 (Middle, Bottom): German Anti-Aircraft Ship Nymphe (formerly the Norwegian Tordenskjold) in 1940. Anchored in a Norwegian harbor during World War II, note her 105mm A.A. guns with camouflaged barrels and crewmen standing in formation on deck. U.S. Naval Historical Center Photograph. Click on photograph for larger image. Figure 4 (Bottom): Models of the HNoMS Tordenskjold (foreground) and HNoMS Eidsvold (rear). Picture taken at the Armed Forces Museum in Oslo, Norway. Click on photograph for larger image. Named after a North American Indian tribe, the USS Pawnee was launched on 8 October 1859 at the Philadelphia Navy Yard and was commissioned on 11 June 1860. The Pawnee was a 1,533-ton light-draft steam sloop of war that was over 221 feet long, had a beam of 47 feet, and had a speed of approximately 10 knots. She was armed with eight 9-inch Dahlgren guns and two 12-pounders, although this armament changed slightly during the course of the Civil War. With a crew of 181 officers and men, she was a very modern warship for her time. After the ship was commissioned, the Pawnee joined the US Home Squadron off the coast of Mexico under the command of Flag Officer G.J. Pendergrast. She arrived off Vera Cruz on 15 October but returned to Philadelphia on 12 December 1860. After spending three months in Washington, DC, the Pawnee was sent as part of a task force to relieve the Federal garrison under Major Robert Anderson at Fort Sumter in Charleston, South Carolina, on 6 April 1861. Unfortunately, the fort surrendered to Confederate forces shortly before the Union warships arrived in Charleston. After sailing back to Washington, the Pawnee was quickly sent to the Gosport Navy Yard in Norfolk, Virginia, on 20 April. The Pawnee was ordered to secure the ships and naval stores that were in the Navy Yard, but after arriving in Norfolk the Pawnee soon discovered that retreating Union troops had scuttled almost all of the ships in the Navy Yard. The only ship that had not been scuttled was the frigate USS Cumberland. The Pawnee towed the Cumberland back to Washington, thereby saving the frigate from being captured by the oncoming Confederate forces. Between May and August 1861, the Pawnee, which was based in Washington, was used to bombard Confederate shore batteries, convoy Union ships and blockade Southern ports. On 24 May a landing party from the Pawnee demanded and received the surrender of Alexandria, VA. In August the Pawnee was assigned to the Atlantic Blockade Squadron at Hampton Roads and she took part in the attacks on Forts Hatteras and Clark (28-29 August). The ship remained at Hatteras Inlet until 3 October and captured four enemy ships and recaptured two ships that were previously taken by the Confederates. On 29 October the Pawnee took part in the attack on Port Royal, South Carolina, and assisted in the Union victory there. During the battle, though, seven shells hit the ship, killing two crewmembers. The victory at Port Royal gave the Union a major naval base in the South and it was of enormous value to the Union blockade and for future amphibious operations. In 1862 the Pawnee patrolled the coasts of South Carolina, Georgia and Florida and she assisted in the capture of Fernandina, Florida, on 3 March 1862. After going back to Philadelphia in November for some repairs, the Pawnee returned to Port Royal on 10 February 1863. For the rest of the war, the Pawnee was assigned to the South Atlantic Squadron and took part in coastal reconnaissance missions off the southern states, bombarded shore installations, and searched for Confederate blockade runners. She captured the Confederate steamers General Sumter and Hattie Brock and participated in attacks on enemy targets that were located on several southern coastal rivers. On 9 February 1865, the Pawnee, along with the gunboats Sonoma and Daffodil, went up Togoda Creek in North Edisto, South Carolina, and bombarded three Confederate artillery batteries, destroying them all. On 23 February 1865, the Pawnee, assisted by several other ships, accepted the surrender of Georgetown, South Carolina. After the war, the Pawnee was decommissioned on 26 July 1865. She was recommissioned on 2 January 1867 and on 24 April was assigned to the US squadron sailing off the coast of Rio de Janeiro. She stayed there for two years protecting American lives and property during the war between Brazil and Paraguay. On 17 May 1869 she sailed home and arrived at Portsmouth on 9 July. The Pawnee was decommissioned again on 22 July and, after a thorough examination, had her engines removed. But the Navy must have thought the Pawnee still had some life left in her because it converted her into a sailing ship. On 6 December 1869 she was sent to Norfolk and served as a floating hospital and storeship. In January 1871 the Pawnee was sent to Key West, Florida, to again serve as a hospital ship and remained there until April 1875, when she was towed to Port Royal for use as a storeship. The Pawnee was decommissioned for the last time 18 November 1882 and was sold on 3 May 1884. 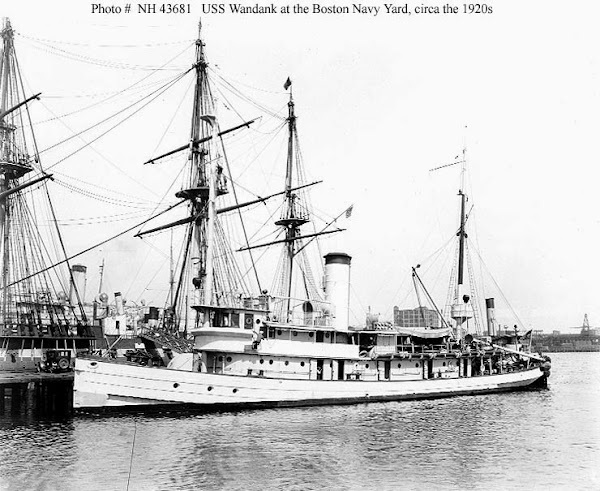 The USS Pawnee had a long and distinguished life, starting her career as a steamship and ending it as a sailing ship. But, whether operating under steam or sail, she provided valuable service to the US Navy, especially during the Civil War. Figure 1 (Top): Artwork or heavily-retouched photograph of the USS Pawnee by the Photo Engraving Company, New York, showing the ship off Charleston, South Carolina, circa 1864-1865. Her bow is fitted with what appears to be a spar torpedo. U.S. Naval Historical Center Photograph. Click on photograph for larger image. Figure 2 (Middle, Top): View on deck of the USS Pawnee, looking forward from near the mizzen mast, while the ship was stationed in Charleston harbor, South Carolina, circa 1864-1865. Guns visible include an Army Model 1841 eight-inch siege howitzer (left foreground) and the ship's starboard battery of nine-inch Dahlgren shell guns. Note sailors on deck and on watch (with telescope) on the bridge, gratings atop hatches, coiled lines, and mechanism for hoisting and lowering the smokestack. Courtesy of the Library of Congress. U.S. Naval Historical Center Photograph. Click on photograph for larger image. Figure 3 (Middle, Bottom): USS Pawnee (1860-1884) off Charleston, South Carolina, circa 1864-1865. Her bow is fitted with what appears to be a spar torpedo. U.S. Naval Historical Center Photograph. Click on photograph for larger image. Figure 4 (Bottom): Rear Admiral John A. Dahlgren, USN, standing beside a 50-pounder Dahlgren rifle on board USS Pawnee in Charleston Harbor, South Carolina, circa 1863-1865. He was then commanding the South Atlantic Blockading Squadron. Identification of the gun is from Warren Ripley: "Artillery and Ammunition of the Civil War", page 104.The original negative for this photograph is held by the Library of Congress (their photo # is LC-B8171-3417). U.S. Naval Historical Center Photograph. Click on photograph for larger image.